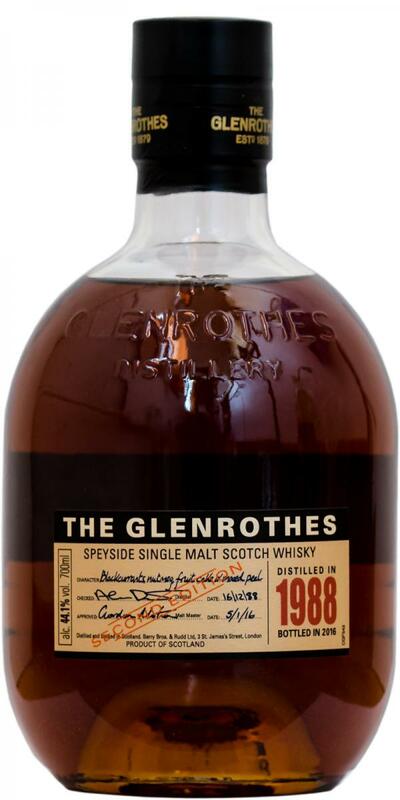 A wonderfully mature, balanced and intense Glenrothes. Intense and dark sherry, slightly sweet, dried fruit, some lemon zest, spicy with a slight mustiness, moist wood, very well integrated alcohol. Over time, a distinct banana note evolves, superimposing all other smells in between. Later, sweet flavors of vanilla kipper and shortbread develop. Spicy onset, sweet sherry, then ginger, some pepper and clear oak come through, dark, slightly bitter cocoa powder lies dry on the tongue, spicy oak notes initiate the finish. Long, creamy with dark chocolate, cocoa chips and walnut. Sauleckeres part, especially wonderful nose, because I could have fumbled on, quite varied, there is a lot of rum. In this respect, it is almost difficult not to be disappointed when drinking - the taste is of course great, but the complete nose carnival is not shown there, is not even. Price outside of my normal budget, but should be appropriate for 'such a yummy OA this age. the nose really excels and the whisky catches nearly up with e.g. the glengoyne 25 yo - but taste & finish are falling slightly ayway. butterscotch, heavy red fruit liqueur, tart oranges, buttery, old & dusty books. cereals, butterscotch, oak, rasberry compote, sweet. mon cherie, leather, tobaco leaves, medium long. Oak dust with a slight touch of resin, mint, old oak, buttery sweetish - floral nectar deposits that blend with oily-creamy-soft citrus notes complex and tell me straight from long Fassreifung, intense sour-sweet oranges of an intensity as you know of oranges TicTac, a red fruit fresh acid with which I passed associated medium ripe raspberries and redcurrants, freshly cooked strawberry jam, a barely perceptible gunpowder / burned match note - which betrays its origin but remains very subtle. First-fill sherry hogshead & refill sherry. N: Heavy butterscotch & orange liqueur, buttery [almost waxy] grasses, sweet citrus putty, moth balls [an indirect piano reference], deep damp mouldy felt,... though ive not come across such a forlorn piano for a while. This nose is all about the mould (cheese and mushroom purveyors need apply). F: .... so far so good, but then there's a rather blatant sherry 'dump' - but hey, that's sometimes the nature of the thing with heavily sherried malts. Take your time. Keep things neat. Rich, dried fruits,old olorosso Sherry,dried raisins,sultanas and black cherries, along with ripe hedgerow fruits, mulberry jam and a tickle of leather. Old spicy and complex. With water: more sweet cake mix,dries cherry and plum. Mmm lovely. This gentle quality continuous. Slow paced, with those sweet dried fruits,roasted its and mature autumn fruits. When neat, soft and wistful. Lovely long. Nice.